I first had this soup in Mississippi at a great aunt’s funeral. In my family, weddings and funerals also double as family reunions – typically involving a whole lot of really incredible food! My cousin Mandy, from Louisiana made this soup and shared the recipe with me. That was over 10 years ago, I have been making it ever since….this is one of our favorites! 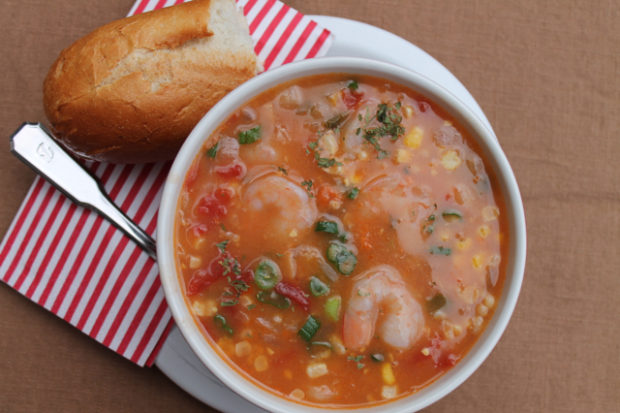 This Louisiana shrimp and corn soup is a great dish to serve on a cold wintery day. 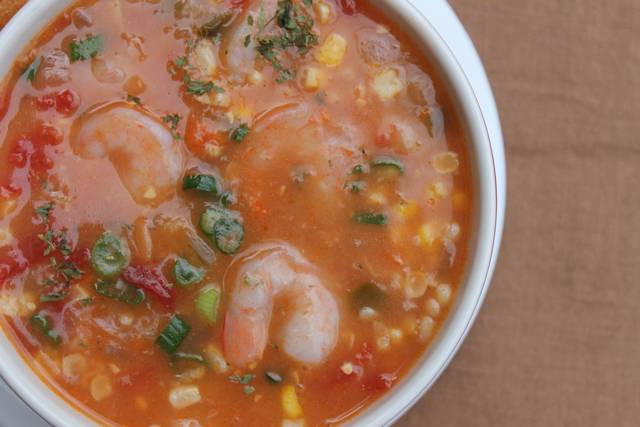 Like many Cajun recipes, this soup starts with a roux. 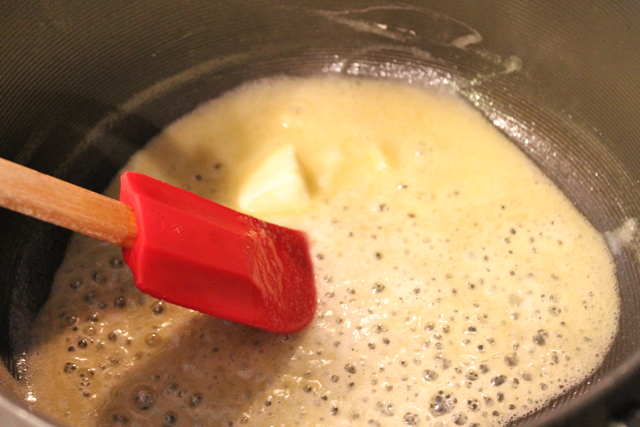 We’ve included Mandy’s tips for stirring up the perfect roux! Begin by melting butter on medium heat and stir in flour. Continue stirring as flour and butter thicken and begin to brown. Our gorgeous paper bag colored roux! 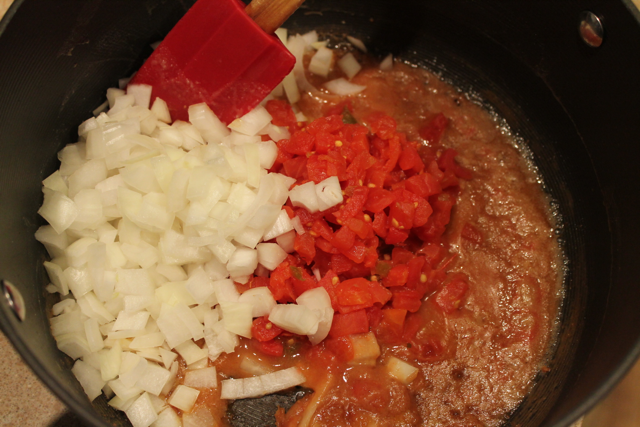 Add onions and Rotel to roux base. Saute until onions are tender. Add remaining ingredients and simmer for 1 hour. Chop onion, set aside. Make a medium brown roux using butter and flour. * When done, add onions, saute. 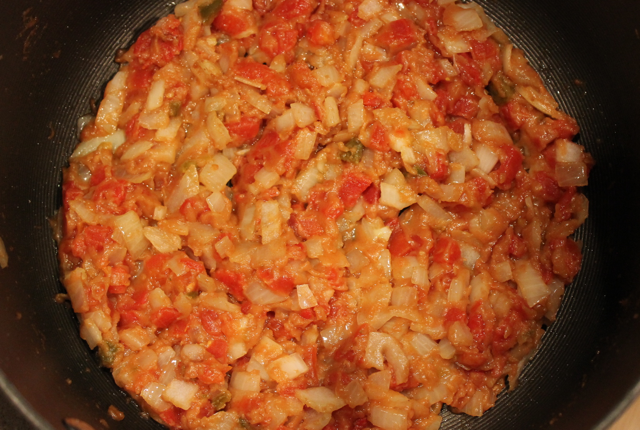 If the consistency is dry or if it seems like it may burn or scorch, go ahead and add the can of Rotel tomatoes. Add tomato sauce, water, corn and shrimp and simmer for 1 hour. Add green onions and parsley, simmer 15 minutes, and serve. Ever made a roux before? If not, we need to touch base on what you will be doing. A roux is like a gravy; it’s browned flour and is used as a base to thicken soups, stews and gumbos. It adds a great flavor and adds a nutty aroma. You CANNOT leave the stove when making a roux. You must constantly stir the skillet, or it will scorch. 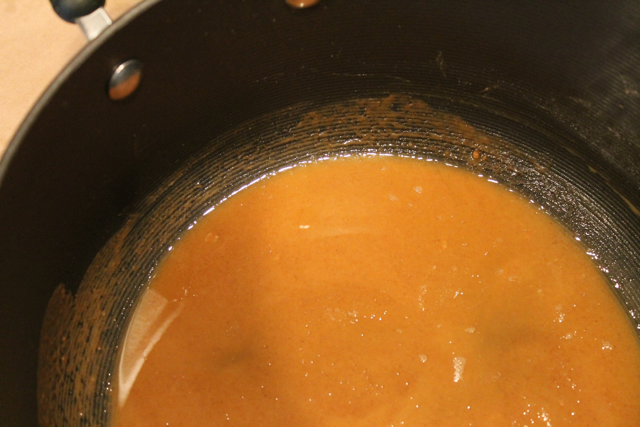 It will take about 10 – 15 minutes for the color to turn and for the roux to be ready. 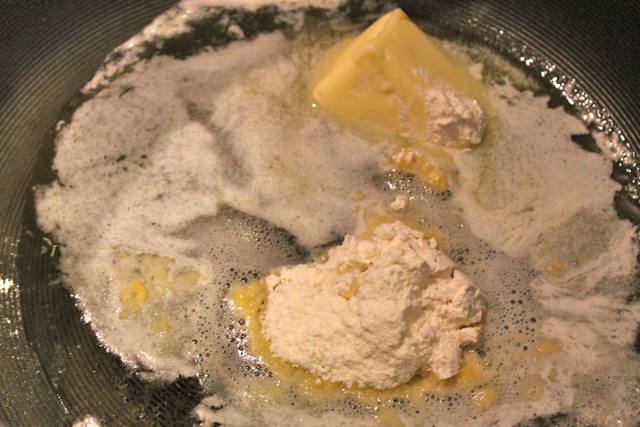 Melt the butter on medium heat and stir in flour. Stir constantly! The mixture will go through a phase where it bubbles and foams a bit. Once the bubbles have gone away, the mixture will begin to darken. The darker the roux the richer and stronger the flavor. We are going for a medium roux for this recipe, a little darker than a brown paper bag. 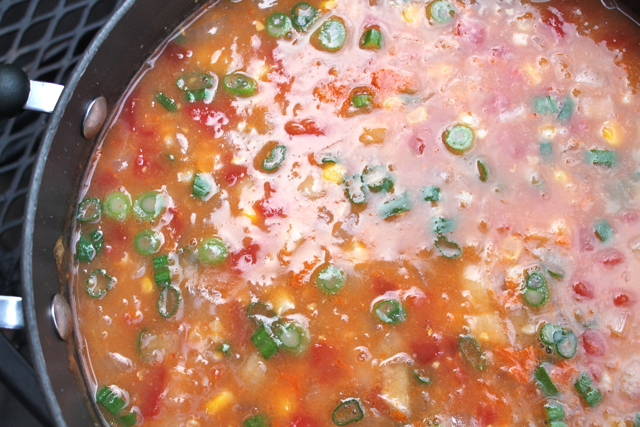 Tip: like many soups, it tastes better the next day, so make a day beforehand and store in the refrigerator. I want to make this tonight SO BAD! But I’m allergic to tomatoes, and they look kind of important to the dish. Wonder how I could adjust this recipe. Carrots instead? Kim- I’m thinking chili peppers would add the flavor you would miss from leaving out the Rotel and throw in an extra can of corn to make up for the tomatoes! Wow Peter! It’s been so long since we talked about this recipe I had forgotten! Thank you for sharing it. We serve it every Christmas Eve to our family and friends. Hi Kim, you can make it without the tomatoes. The Rotel give it a little kick and some acid to balance the sweetness of the corn. Carrots will make it sweeter. A touch of lemon juice would serve the purpose, and if you want the red look in the dish, you could use roasted red pepper. I’ve never tried that, but it would provide color without changing the makeup of the dish. I hope this helps! Thanks again Peter and Sunshine. What a surprise. Love y’all! Mmmm yummy! I wish they had Rotel in Canada. 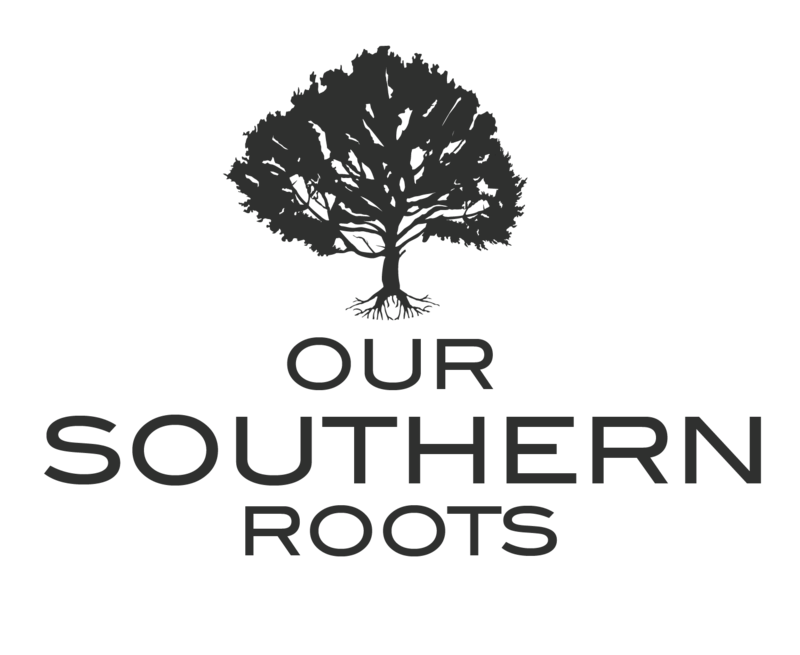 I lived in Beaumont, Texas for 10 years and fell in LOVE with all things Southern. I just found your blog today and I am excited to follow it. I’m alergic to shrimp so I know very little about them. The one pound of peeled shrimp in this recipe are the boiled or raw? We used pre-cooked shrimp and added the shrimp towards the end so they were completely heated, but not over cooked. If you choose to use raw shrimp – make sure they are peeled and add them earlier on so they are completely cooked. You can order Rotel from Amazon. I buy alot of items online from them. How many servings does this soup make?